This spiced chai latte is what I start most mornings with and most definitely when an unwelcome cold or flu virus pays a visit! The warming spices are the perfect antidote to cooler weather and have scientifically proven benefits including antibacterial, immunity-boosting and anti-inflammatory properties. Shikimic acid which is the active ingredient of the anti-viral drug Tamiflu is actually derived from star anise! In addition, cloves contain eugenol which reduces blood clotting and can aid in the relief of a sore throat. If only all our meds tasted this good. In a medium sized pot, bring the water and whole spices to a boil. Reduce heat to a low simmer for 5 minutes. Add the milk and continue to simmer for an additional 5 minutes. Add the tea leaves or tea bags, give the pot a stir and simmer for 3 minutes. For a stronger, darker brew, allow the pot to rest off the heat for another 2 minutes. Strain into your favourite cup, sweeten if you like and enjoy. 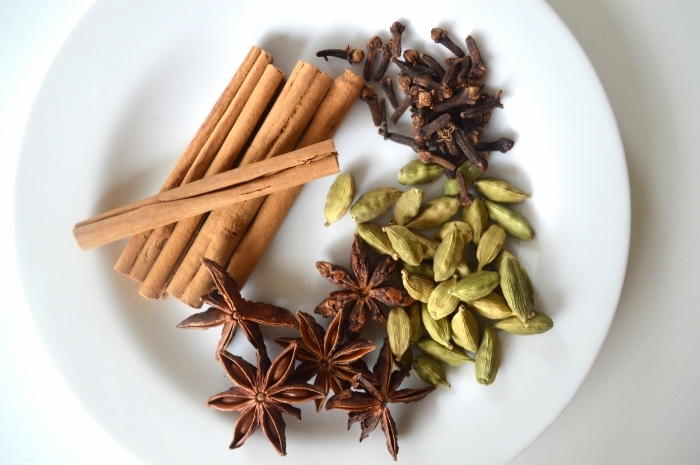 For a quick albeit less spiced version, place the whole spices in a tea pot or in a strainer placed in a large mug. Pour boiling water and tea leaves/bag and brew for 5 minutes. Add a splash of milk, sweeten if you need to and enjoy. Spice up your family's health!